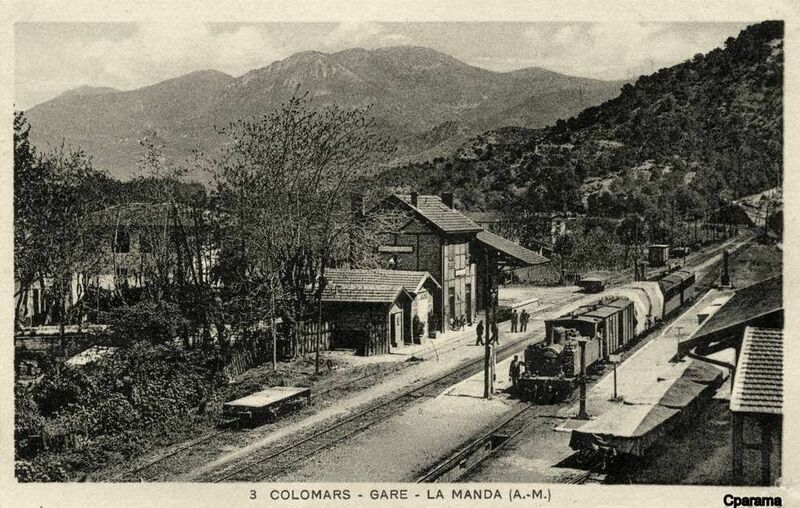 The post above contains a significant number of images of Colomars/La Manda Station. 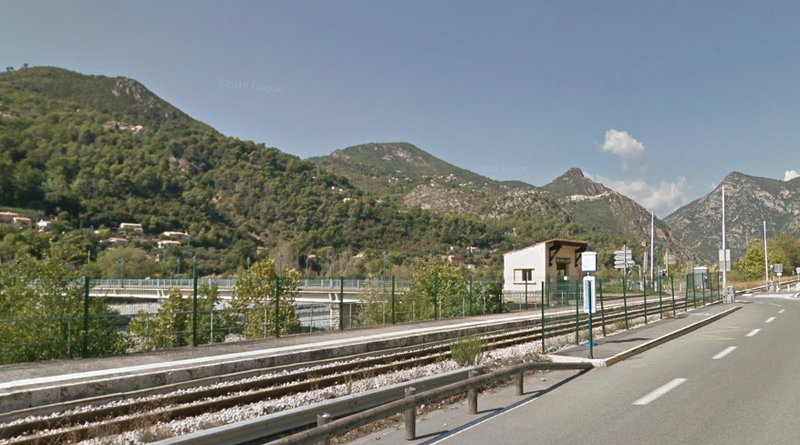 We begin the next stage of our journey along the Nice to Digne les Bains line at Colomars Station. 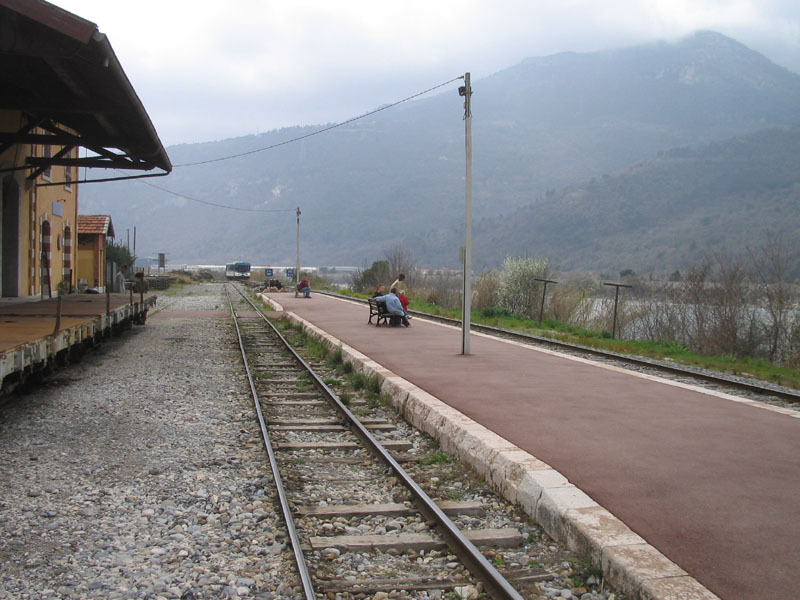 The modern halt is on a section of railway line which was not part of the original alignment. 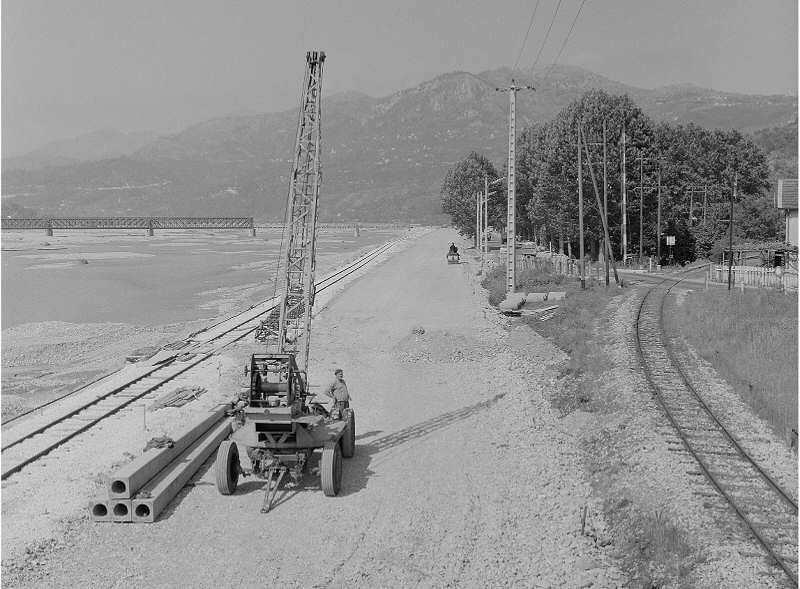 The as-built alignment had to accommodate access for the branch-line to the bridge over the River Var and had to allow for a height gain to permit trains to travel over the top girders of the truss-bridge over the Var. 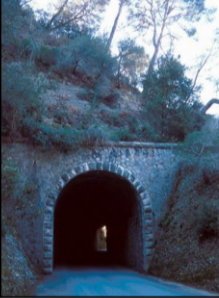 The tunnel is known as Le Tunnel de Vallade. 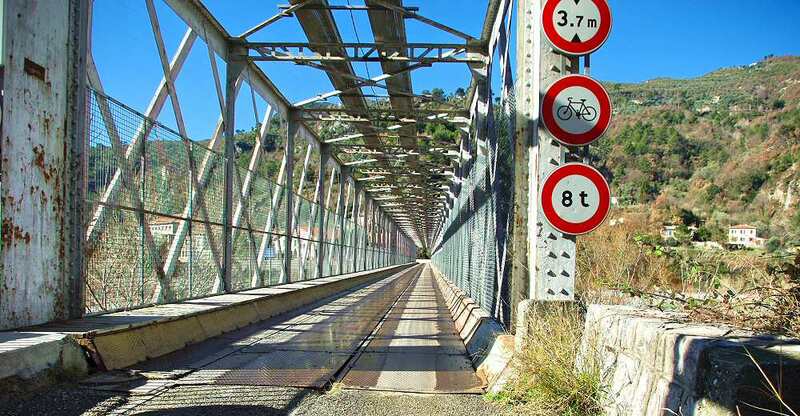 It is approximately 50m long and is just over 65m above sea-level. 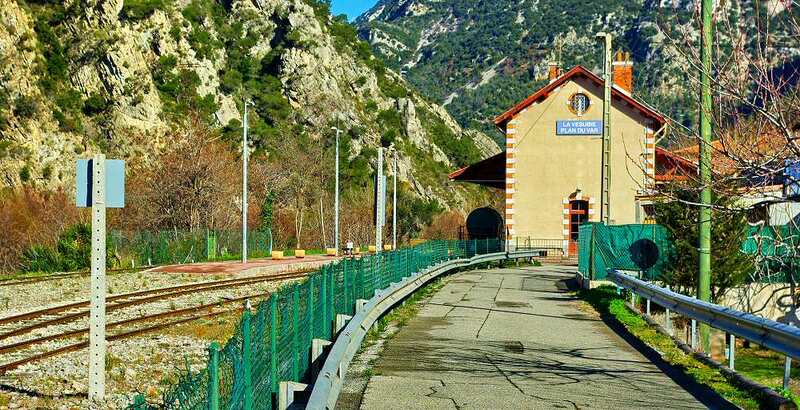 Its use as a pad tunnel means that it has been kept in good condition since the railway like he was diverted. 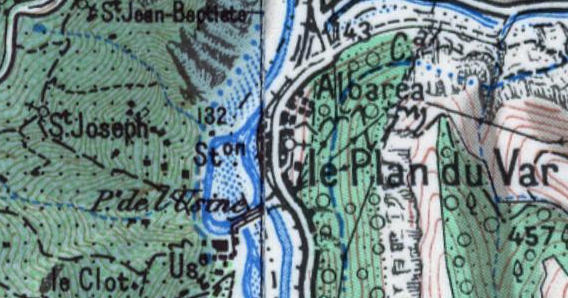 North of the tunnel, the line drifted back towards the bank of the River Var to join the present alignment of the railway. 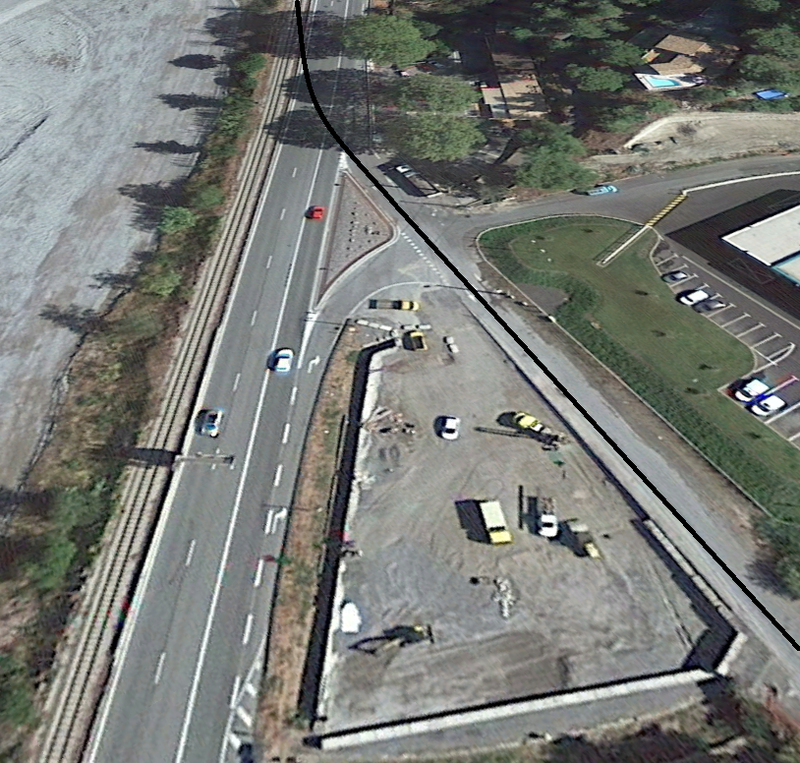 The old line is shown by the black line on the Google earth satellite image below. 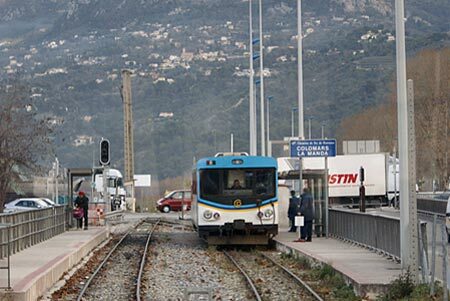 The line then followed the East bank of the Var to St. Martin du Var which was the next station on the route. 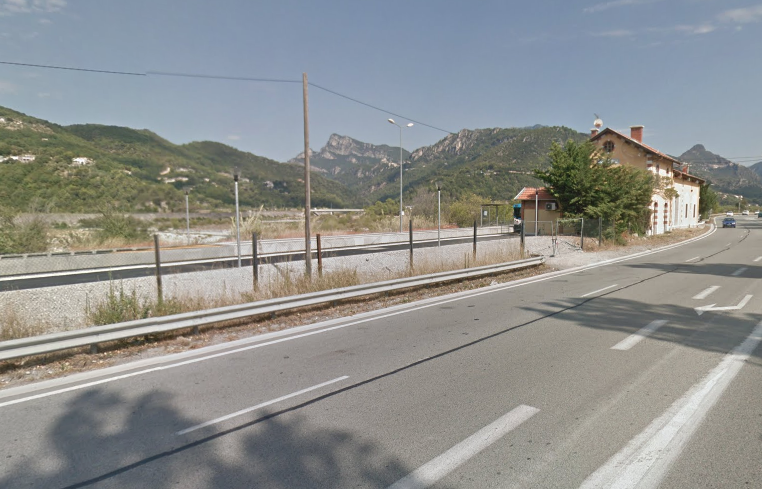 The next three images are taken from Google Maps Streetview and show the approach to the station at St. Martin du Var. 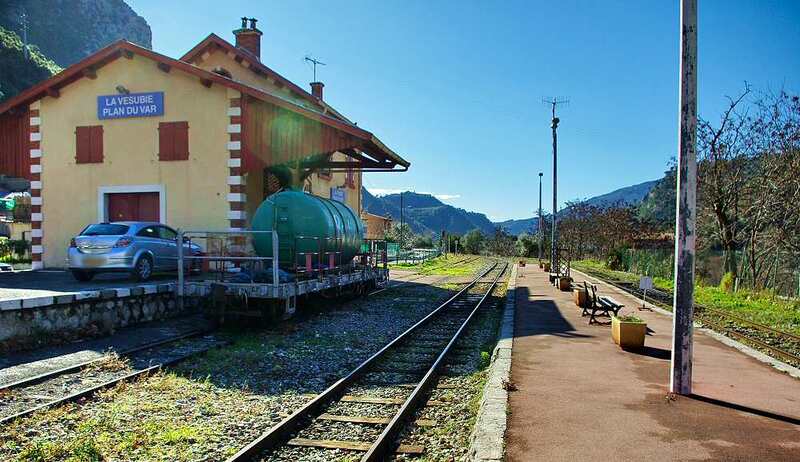 The three images immediately above are taken from the website, ‘Le Train de Pignes’. 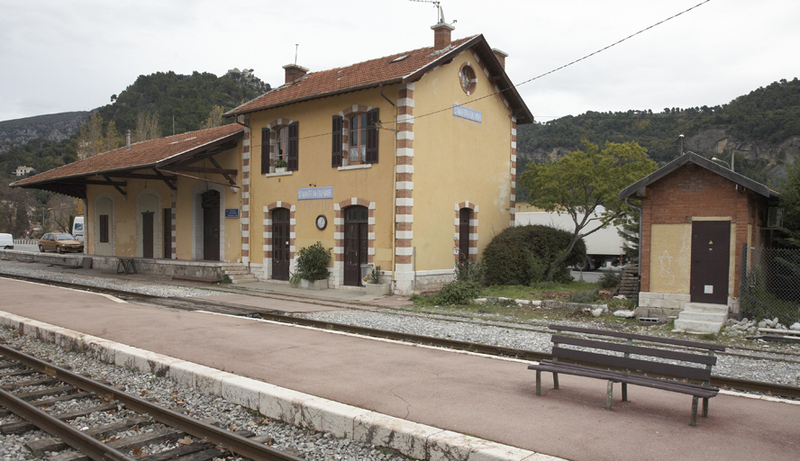 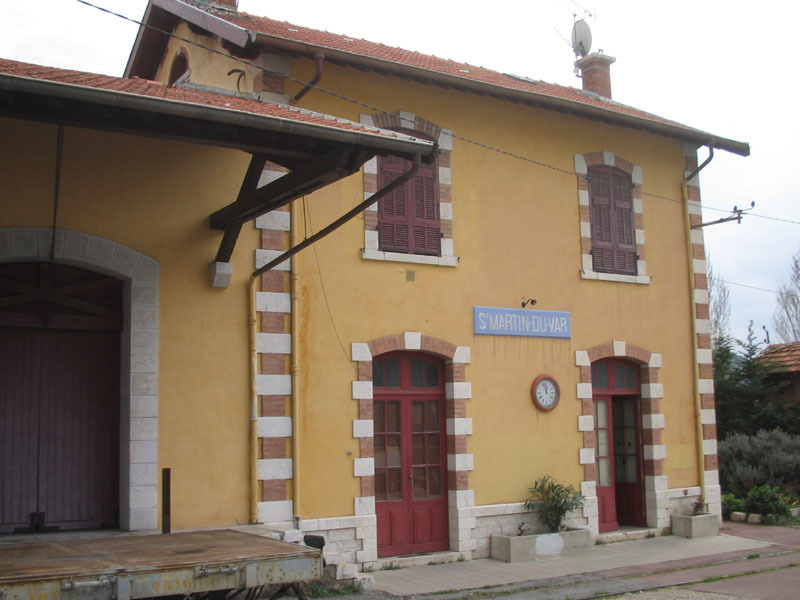 A trackside view of the station building at St. Martin due Var. 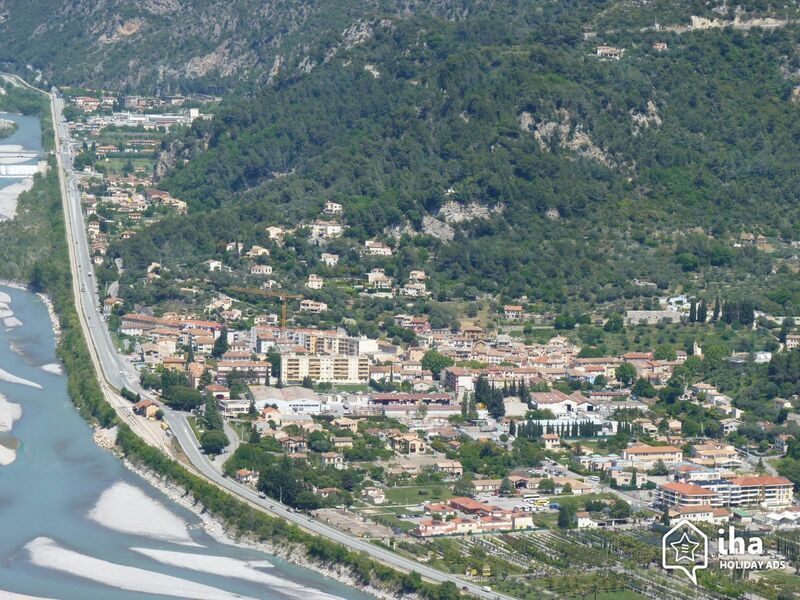 Two aerial shots of St. Martin du Var. 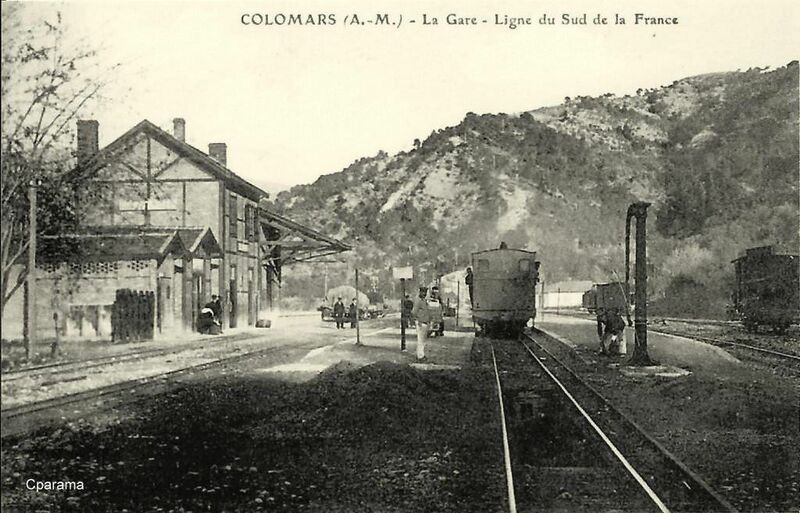 The first from the south. 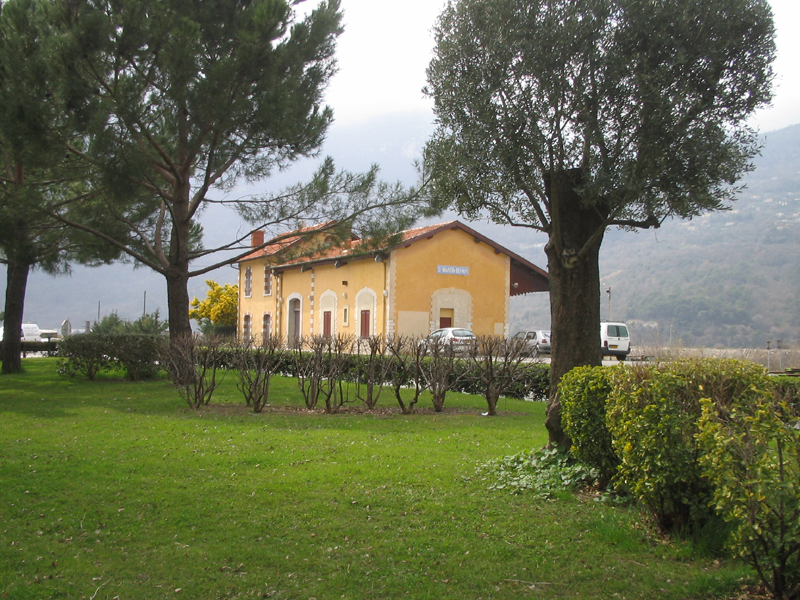 The second from the Northeast, shows the station buildings on the right of the photograph. 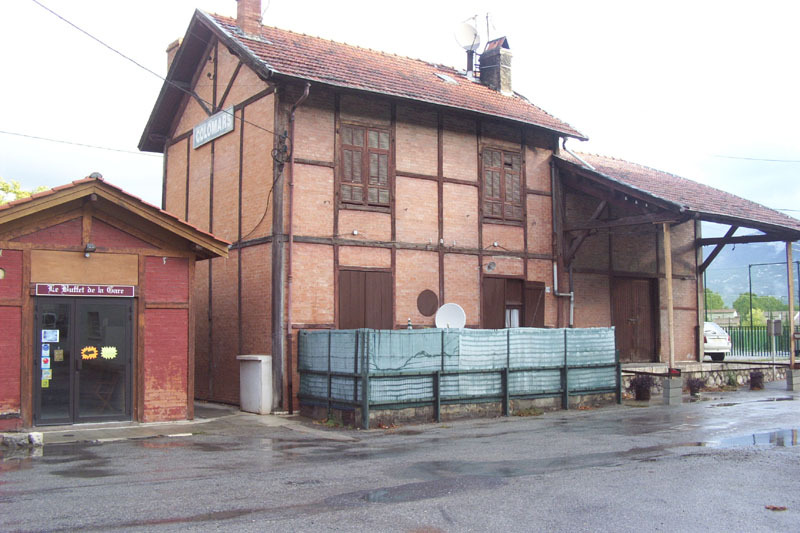 These two pictures show the station in its modern context. 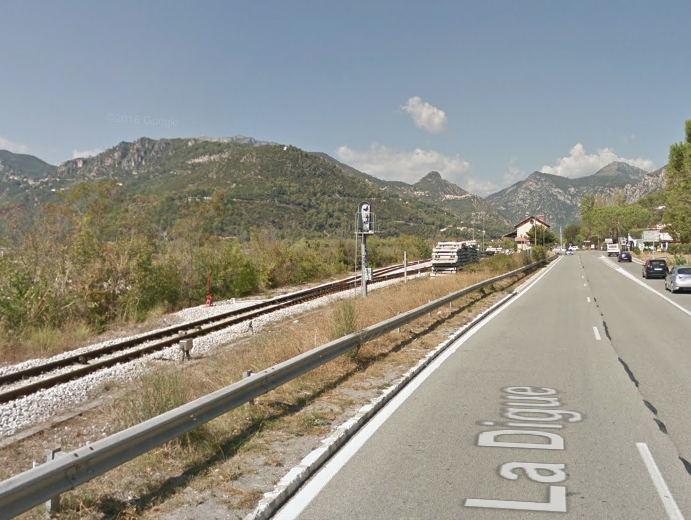 The line continues to follow the east bank of the Var passing through the halt at La Roquette-sur-Var (immediately below). 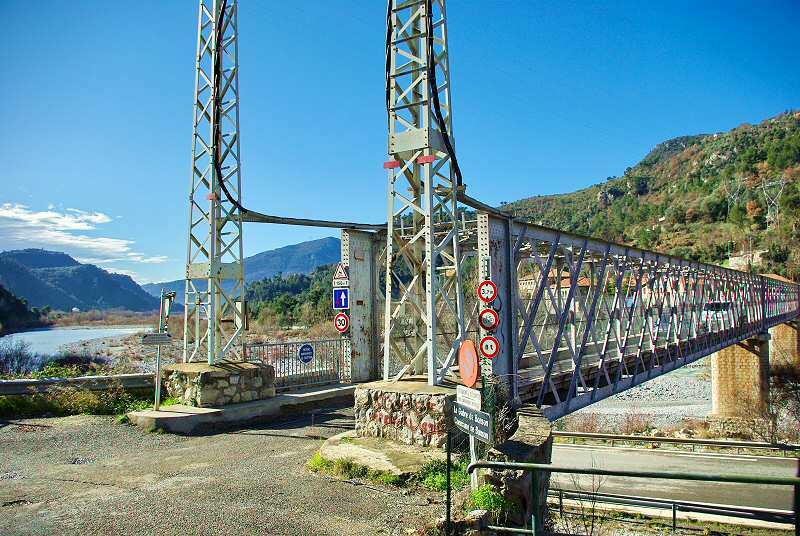 The bridge behind the halt is Pont Charles Albert and gives its name to the halt. 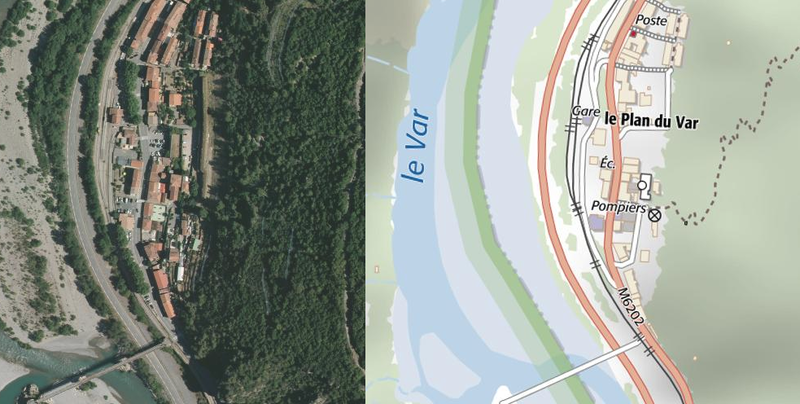 The three images immediately above are taken from the formule4 site and show the location in the 21st century. 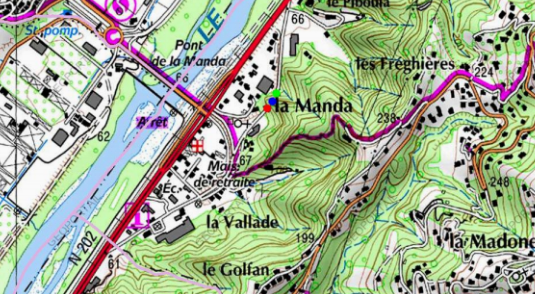 The image below was also found on the formule4 site but was sourced from BNF Gallicia. 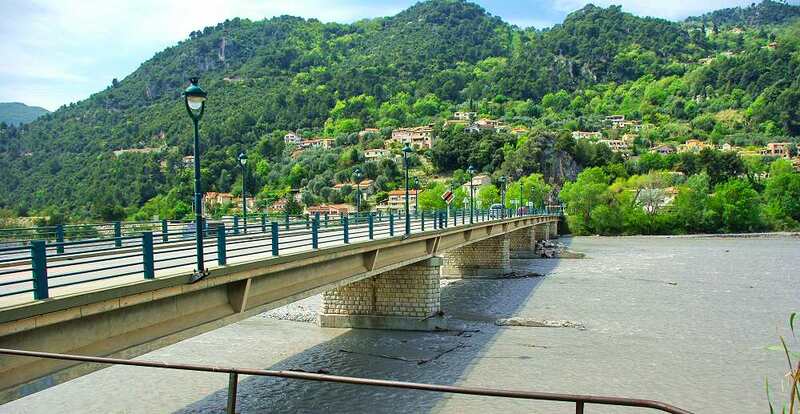 It shows the original bridge, a suspension bridge across the Var and interestingly a standard-gauge railway which connected the Baus Roux to the mouth of the Var by means of a cariole pulled by horses heading up the valley away from the coast and descending under gravitational power towards the coast. 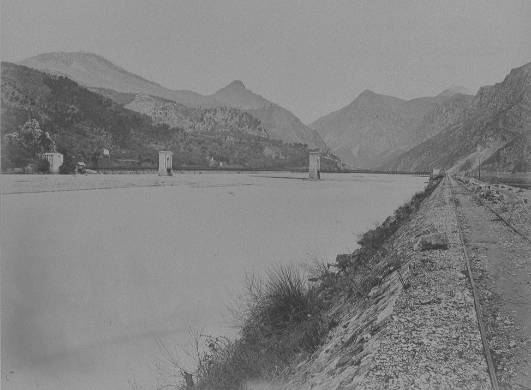 A cariole was a type of carriage used in the 19th century. 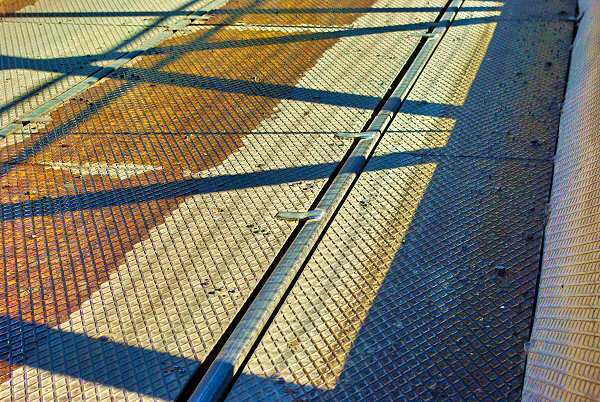 It was a light, small, two- or four-wheeled vehicle, open or covered, drawn by a single horse. 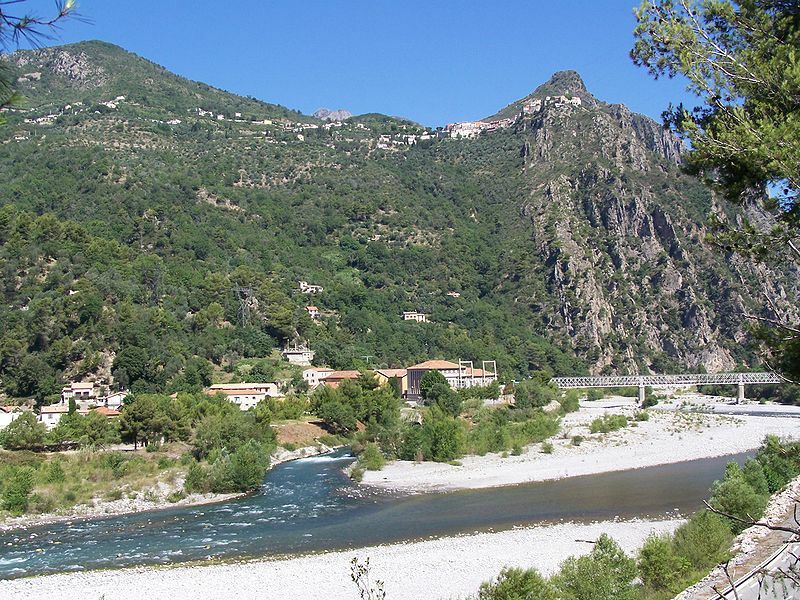 The Baus Roux was an industrial area just to the north of the Pont Charles Albert on the East side of the Var. 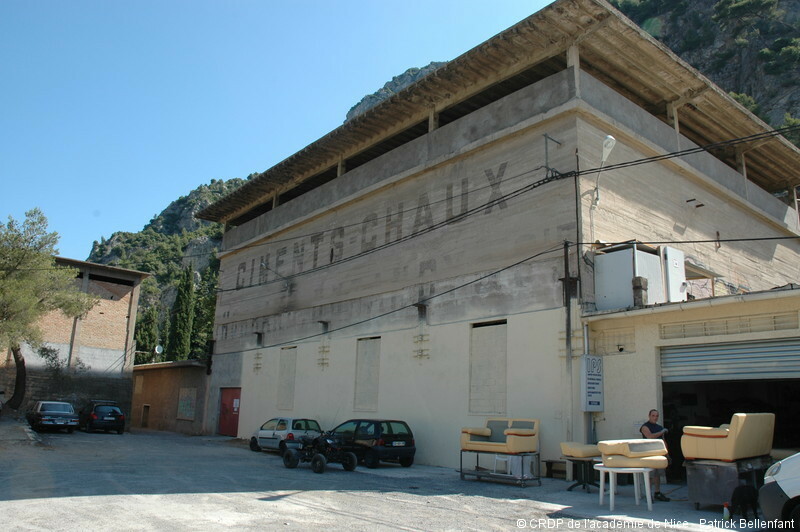 Two pictures of the old cement works at Baus Roux. 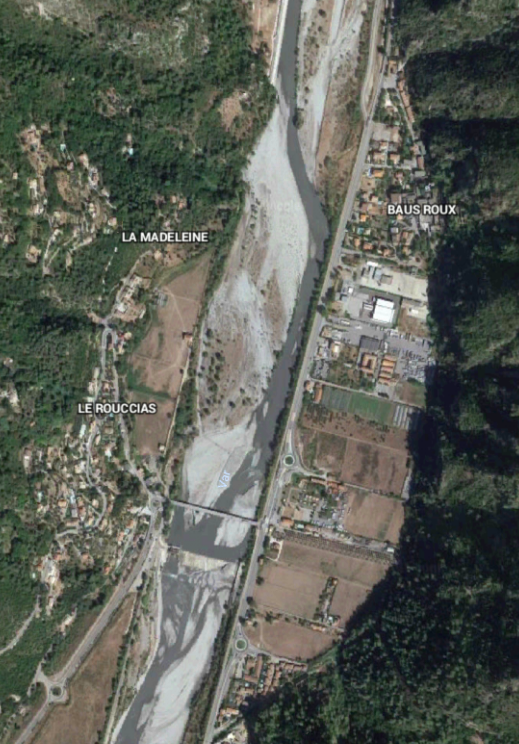 The bridge in the bottom half of the above satellite image is Pont Charles Albert. 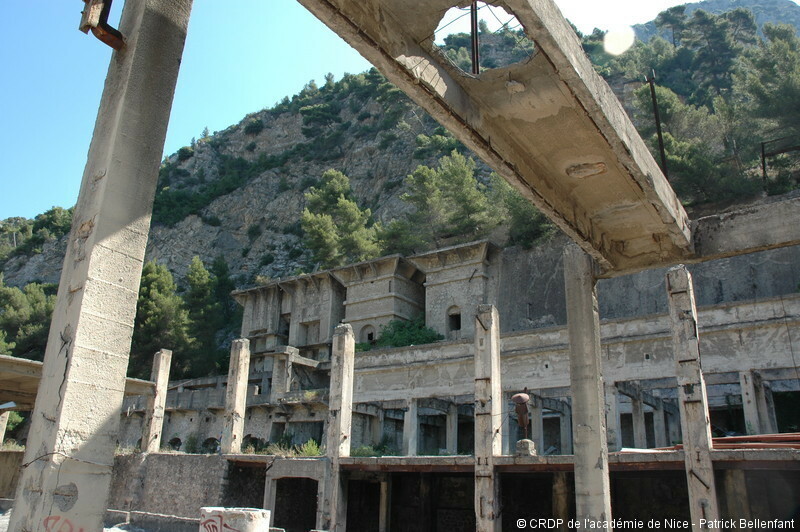 one of the abandoned cement works is immediately below the words ‘Baus Roux’. 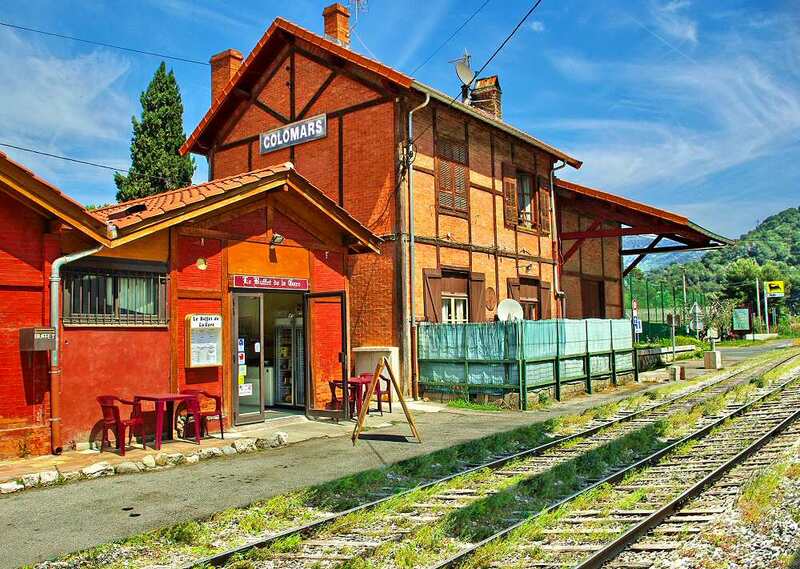 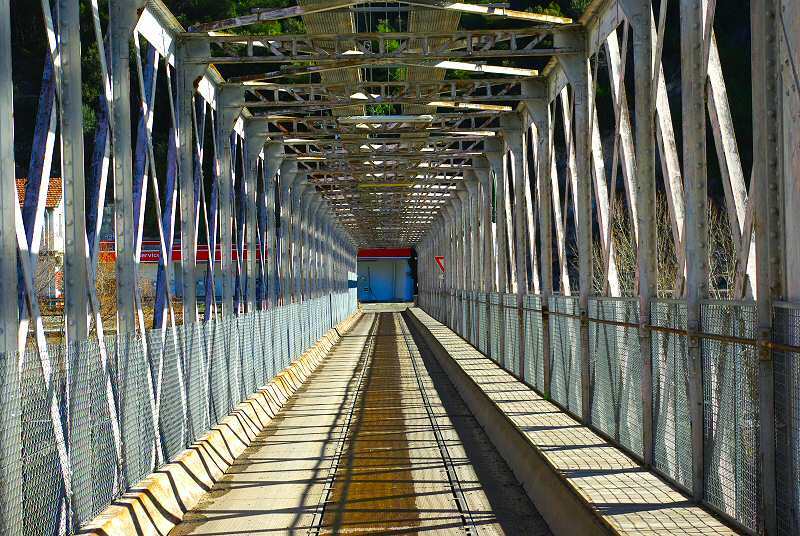 The next few images of the station at Plandu Var come from the ‘formule4’ website. 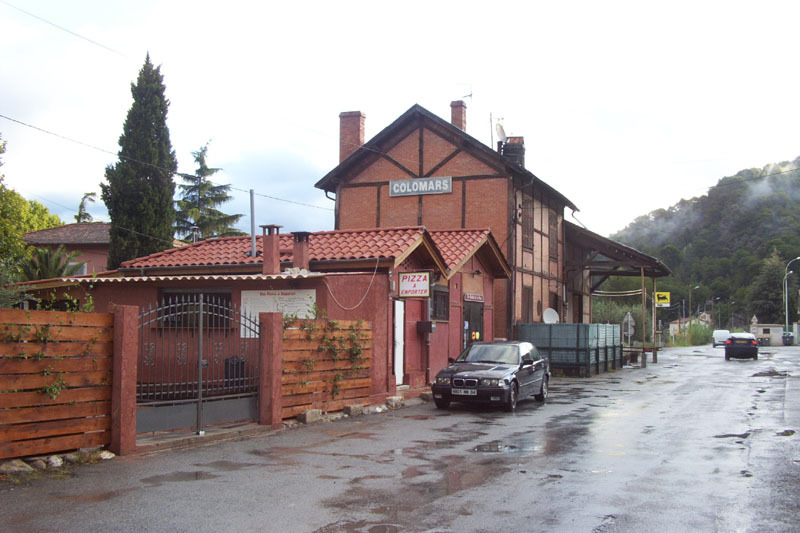 Looking north through the station. 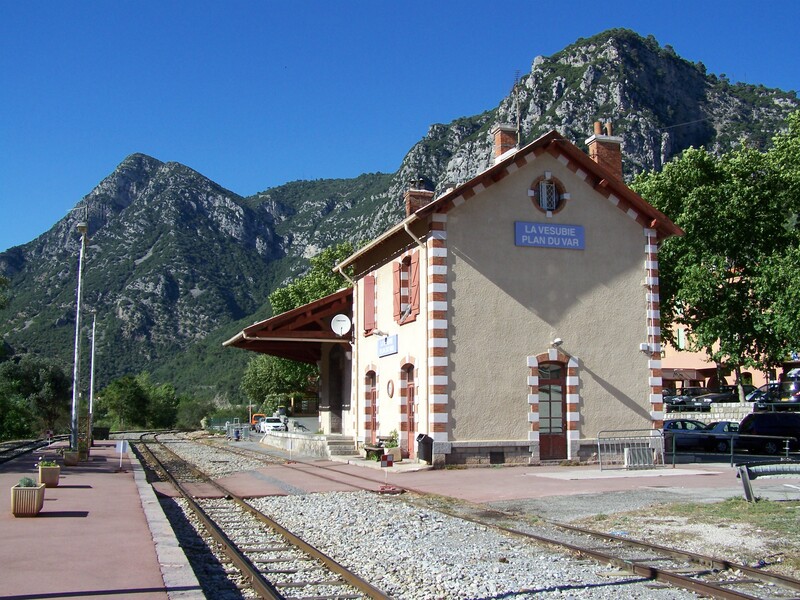 The station buildings with the village off to the left. 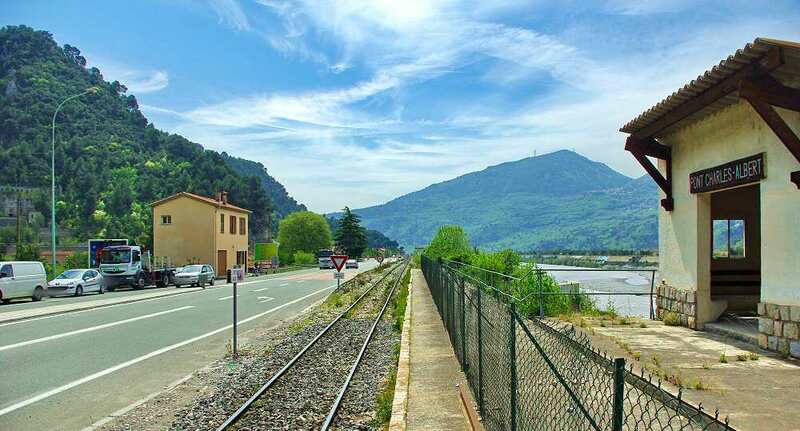 Looking North from the station into Les Gorges de la Mescla. 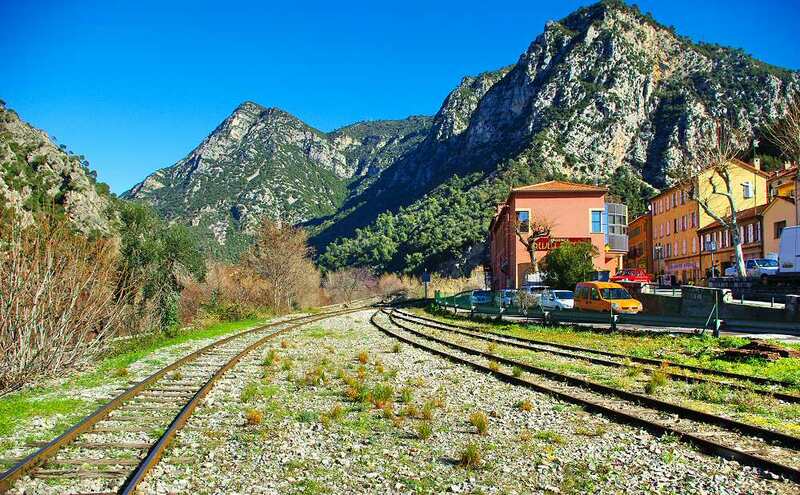 Just beyond the building on the right the tracks coverage to a single line once again. 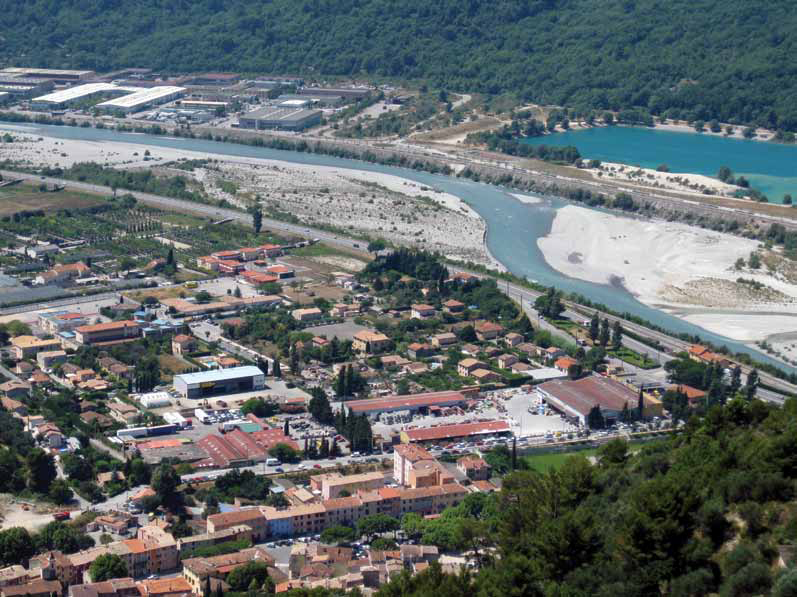 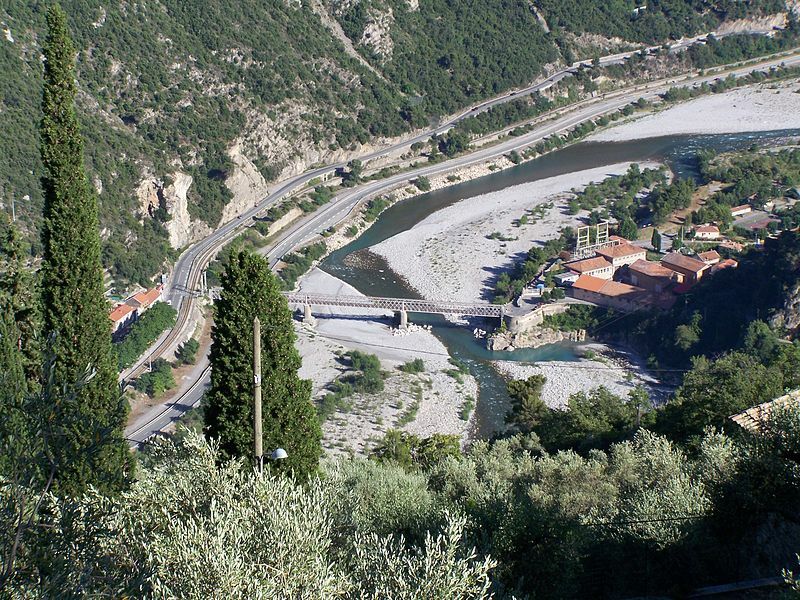 The buildings on the left were originally associated with the tramway which ran up the Vesubie Valley. 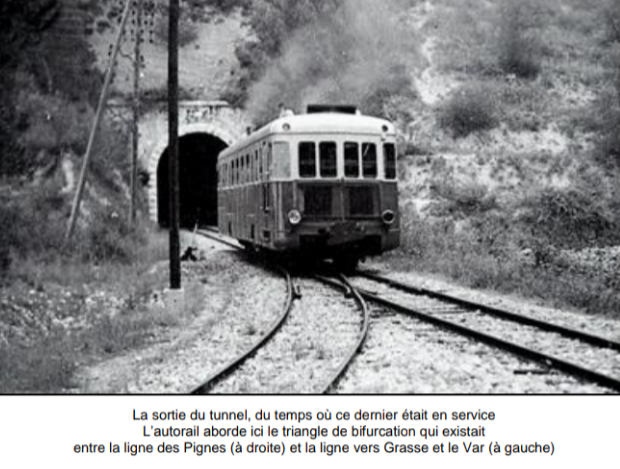 http://cccp.traindespignes.free.fr/phototheque-nostalgie.html, accessed on 20th November 2017.
http://www.tunnels-ferroviaires.org/inventaire.htm, tunnel No. 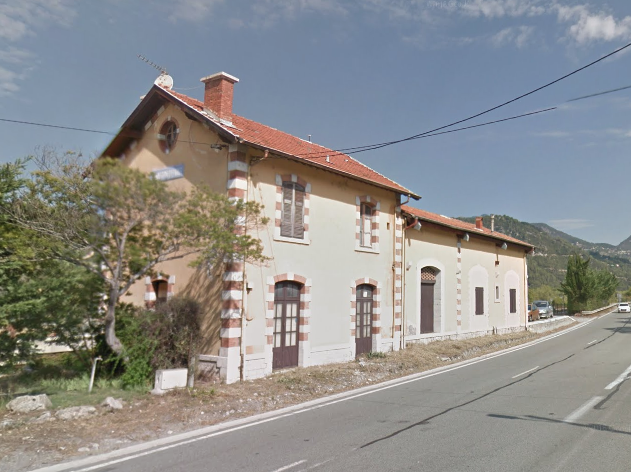 06046.1, accessed on 7th July 2018.
http://cccp.traindespignes.free.fr/gare-stmartin.html, accessed on 7th July 2018.
https://dossiersinventaire.regionpaca.fr/gertrude-diffusion/dossier/gares-des-chemins-de-fer-de-provence/5db69410-c3ec-4217-b30c-92f975a65c27/illustration/57, accessed on 7th July 2018.
https://www.iha.co.nl/vakantiehuis-saint-martin-du-var/Am=, accessed on 7th July 2018.
http://www.ecovallee-cotedazur.com/projects/the-eco-district-saint-martin-du-var, accessed on 7th July 2018.
http://www.formule4.com/route_code.php?rcode=35#wpt12, accessed on 7th July 2018.
https://gallica.bnf.fr/ark:/12148/btv1b12000805.item.r=pont+charles+albert.f18.langFR, accessed on 7th July 2018.
http://www.valleeduvar.fr/index.php?page=gypse, accessed on 7th July 2018.
https://commons.m.wikimedia.org/wiki/File:Bonson_(Gabre).jpg, accessed on 8th July 2018.
https://commons.m.wikimedia.org/wiki/File:Bonson_(Gabre-2).jpg, accessed on 8th July 2018.
http://www.formule4.com/route_code.php?rcode=35, and http://www.basesdocumentaires-cg06.fr/os-cgi/cgixpd.exe?exec=DOCUMENT&mode=0&start=20&num=28&fnmq=&fnmr=foto/page-r.html&fnmd=foto/page-f.html&q_ft_any_text_column=manda, accessed on 8th July 2018.
https://remonterletemps.ign.fr/comparer/basic?x=7.197585&y=43.855283&z=15&layer1=GEOGRAPHICALGRIDSYSTEMS.MAPS.SCAN50.1950&layer2=GEOGRAPHICALGRIDSYSTEMS.MAPS.SCAN-EXPRESS.STANDARD&mode=doubleMap, accessed on 8th July 2018.
https://remonterletemps.ign.fr/comparer/basic?x=7.196726&y=43.856888&z=17&layer1=ORTHOIMAGERY.ORTHOPHOTOS&layer2=GEOGRAPHICALGRIDSYSTEMS.MAPS.SCAN-EXPRESS.STANDARD&mode=doubleMap, accessed on 8th July 2018.
https://commons.wikimedia.org/wiki/File:Gare_de_Plan_du_Var.jpg, accessed on 7th July 2018. 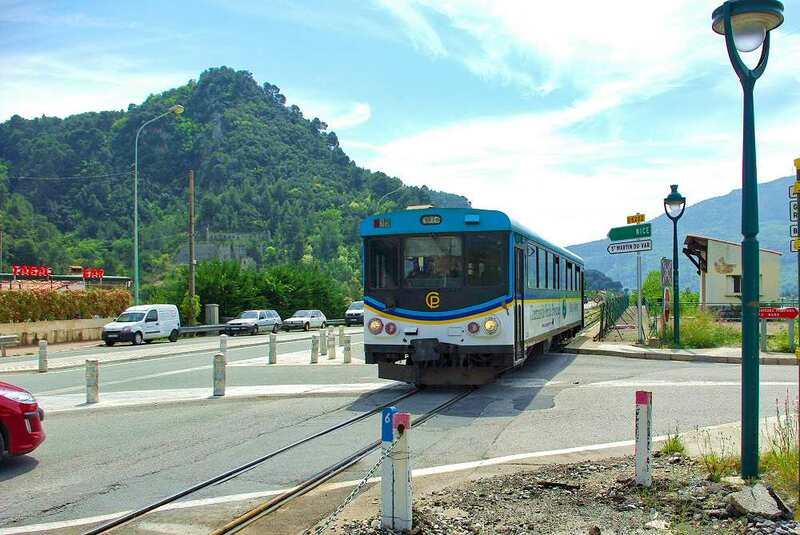 This entry was posted in Railways and Tramways Around Nice, Railways Blog on July 8, 2018 by rogerfarnworth.